Make sure you have enough fuel for the next 3 jumps here ! - Use Dr. Kaii's Fuel Calculator at this waypoint, before moving on to the next waypoint. You must use a J2 to get to the next system on the route and continue through all the waypoints as instructed for it to be accurate. Note : In Beta it required a heatsink to safely land at basecamp 1 (Hades Edge - see the video on post #2). Testing the route in 2.2 the orbits have shifted and the worlds no longer sit within the stars corona, so a heat sink may no longer be required. But take one just incase the basecmap world has an elliptical orbit and is back in the corona by Jan 15th. Important information for the Distant Stars Fleet. We currently have 7 flotilla flagships. These flagships will act as wing beacons and will all be in separate instances from one another. DSE participants are advised to send in game friend requests to each of the beacon pilots. If you want to join an official fleet instance during the fleet build up at Obsidian Orbital, you will need to hail one of the beacon pilots and request a wing invite. Join the Fleetcomm private group. From 1700 gametime on Sunday, begin massing in orbit around Maia Prime. In game choose a beacon pilot and ask for a wing invite. The beacon pilot will add you as soon as they can or ask you to hail another beacon pilot. Once you're winged, engage wingman navlock onto your beacon pilot, and head to obsidian orbital. You should arrive within the same instance as your chosen beacon pilot. 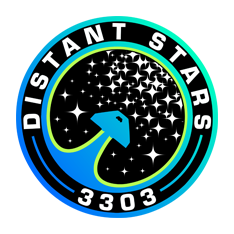 Once you're confirmed as being in an official instance outside of Obsidian Orbital, please leave the wing, then help wing in fellow fleet members by sending out wing invites to those requesting wings on the DSE Wings Channel. Once your instance approaches 50 players, immediately cease winging pilots in. At 1800 Gametime the 7 beacon pilots will coordinate a mass launch. All ships in the flotilla need to set course to Merope, and align to that system. Keep an eye on local chat for the launch countdown. Everyone is to launch on your beacon pilots command. This concludes the launch event. From Merope pilots are free to travel to the next waypoints at your leisure (coordinated jumps not required), but please be at Hades Edge basecamp by 1930 if possible, and early arrivals please help fellow pilots reach the landing site by sending out wing invites to those asking for them in local chat. At 2030 the fleet will depart for the Cancri Climb waypoint. From there the next fleet mass gathering will be at the Descion Point neutron star at 2200. Once the fleet has assembled, another mass jump will occur into the AH Cancri star system. This concludes day 1 of the DSE mission. 15 waypoints in DSE (M67 Expedition Jan 3303) route. Location of the first hyperdiction by aliens (Jan 5 3303). Optional visit en-route to Maia. Scientific POI. Optional visit en-route to Hades Edge. Basecamp 1 is located on Planet 1 (surface coords to follow). High G Warning! (2.66 G). Beginning of the Cancri Climb. J2 Jumponium boost required for next waypoint jump. Part of the Cancri Climb. J1 or J2 Jumponium boost required for next waypoint jump. Part of the Cancri Climb. Part of the Cancri Climb. J2 Jumponium boost required for next waypoint jump. Part of the Cancri Climb. Neutron Supercharge required for next waypoint jump. Part of the Cancri Climb. White Dwarf Supercharge required for next waypoint jump. End of the Cancri Climb. Neutron Supercharge required for next waypoint jump - the point of no return. J3 Jumponium boost required. 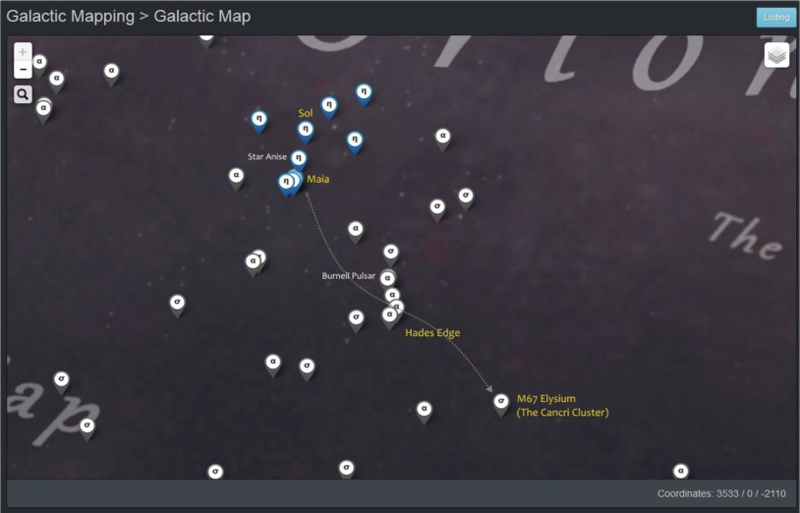 Basecamp 2 is located on a planet within this system. 14 day survey of the Cancri Star Cluster begins. J3 Jumponium boost required. Basecamp 3 is located on a planet within this system.